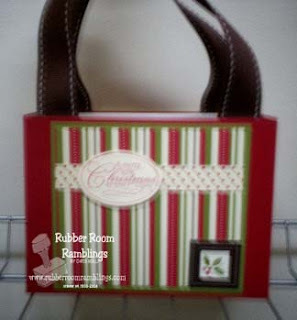 Rubber Room Ramblings: BOXES FOR CHRISTMAS JINGLE SIMPLY SCRAPPIN' KIT CARDS! BOXES FOR CHRISTMAS JINGLE SIMPLY SCRAPPIN' KIT CARDS! Here are two boxes that will each hold 10 cards and envelopes. Michelle and I put together 20 cards (you can see all of them below) useing one-half of a Christmas Jingle Simply Scrappin' Kit and then we made these two boxes to hold the cards. This is the perfect gift for someone with a birthday in October or November. And if you can't make yourself give them away, there is no quicker and easier way to make your holiday cards. 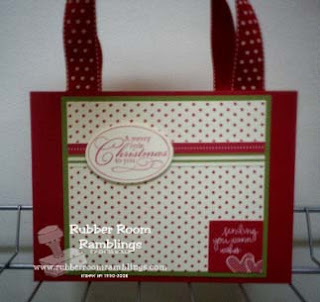 From one kit you can make forty (yep, 40) Christmas cards. The Christmas Jingle Simply Scrappin' Kit can be found on page 23 of the current Holiday Mini Catalog, and qualifies for the September hostess special. What is the special? Hold a qualifying workshop in September, and pick any item from the Holiday Mini Catalog for only $10. That makes this Christmas Jingle Simply Scrappin' Kit an awesome deal at a 50% savings!! You can also find the Christmas Jingle Simply Scrappin' Kit in the current Stampin' Up! Idea Book and catalog on page 165. The cost of the kit is $19.95 and the item order number is 115696. Please contact me to place your order, or order 24/7 with my Order Online button on the very top of my right-hand side bar!